The formatting view allows you to change how a table set or a particular table is displayed. The same formatting view is used for both table sets as a whole and for individual tables. The formatting applied to a table will take precedence over the table set formatting. Change the text and background colour by selecting a colour from the colour swatch under ‘Text Colour’ or ‘Background Colour’. The selected colour is shown in the preview box. The colour swatch is quite large so scroll around to find the colour you want. If you can’t find the exact colour you need you can specify it precisely in the ‘Advanced Formatting’ section (see below). 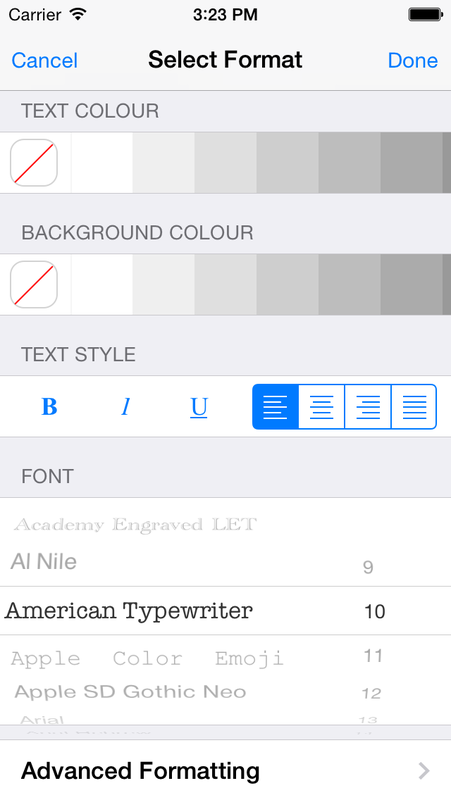 Change the text style (bold, italic or underlined) by tapping the appropriate button in the ‘Text Style’ section. You can also change the text justification (left, centre, right and justified). Change the font family and size using the pickers under the ‘Font’ section. Only the fonts that are installed on the iPhone are available, and their names are shown using that font, giving you a preview. Tap the ‘Advanced Formatting’ item to get full control of the formatting. 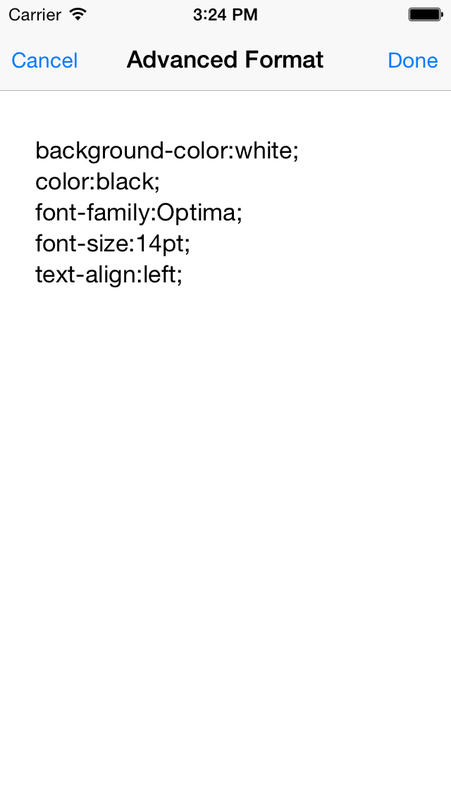 This is simply a text editor that allows you to input CSS properties that are applied to the table set or table as appropriate. Note that you can put any CSS property you like in here, although some may not make sense or work as intended. For example, if you put a 1000 pixel margin around the table set then you may not see anything! The properties must be ‘well-formed’, that is, the property name and the value must be separated by a colon, and the line must end with a semi-colon (i.e. ‘property : value ;’). Properties that do not conform will be removed. These will be displayed inn the pickers on the ‘Select Format’ view as they are valid CSS properties. However, the Comic Sans font does not exist on the iPhone so the app will do its best to find a similar font. A font size of ‘small’ is, however, valid and will be accommodated. Table entries can also contain links to web pages, e.g. Tapping the link will launch the Safari app.